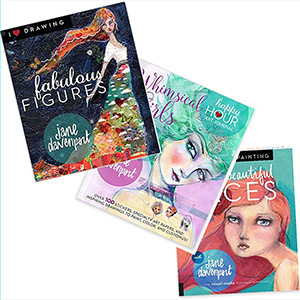 Drawing and Painting Beautiful Faces is Jane's newest book published by Quarry in the USA. it is an inspiring, mixed media workbook on how to create enchanting, fashion illustration–style portraits. Author Jane Davenport is a beloved artist and workshop instructor known internationally for her effervescent, enthusiastic, happy, and encouraging style. View cart “Love and DevOcean Postcard book” has been added to your cart. Drawing and Painting Beautiful Faces is Jane’s newest book published by Quarry in the USA. it is an inspiring, mixed media workbook on how to create enchanting, fashion illustration–style portraits. Author Jane Davenport is a beloved artist and workshop instructor known internationally for her effervescent, enthusiastic, happy, and encouraging style.